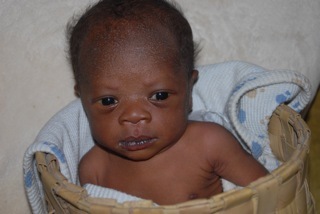 It was the first new life I witnessed being brought into the world in Chad. The mother had been rushed into an emergency C-section due to Eclampsia. No one knew if the baby would be developed enough to live outside the womb. I helped set up the resuscitation equipment. We were bound and determined to give the little mite a fighting chance. There was expectancy and tension snapping in the room when the little tike was handed off to a waiting maternity nurse. Olen, the nurse and I descended on him with bulb syringe and vigorous toweling. The next few minutes were filled with much slapping, tickling and cold water splashes, after which Olen yelled out "Hey, we've got one, dear!" Danae's response was a doubtful ". . . for now." My heart melted as I watched him turn from floppy blue to squirming pink. They handed him to me to go show the family. As I carried him through the surgery doors he opened his eyes and squinted up at me. "Hello there buddy!" I cooed. "Welcome to the world!" Since Danae wanted to keep him under observation I got to hold him for the first 30 minutes of his life. He was tiny but very alert and spunky. Unfortunately all our efforts were not enough to save his mother’s life. Her life of sixteen years was far too short. When I heard, I immediately wondered what would become of "my" little baby. None of the family seemed to want him, so Danae and Olen took him in, until something could be worked out. No one knew what would happen, or for how long we would have him, but everyone pitched in to care for baby. As much as we tried to stay unattached, his adorable face was hard to resist. After only a day or two I knew I loved him. It’s scary feeling love for someone who's future is so uncertain. When I sat and fed him, I silently prayed God would make this little man into a warrior for God. Certainly he had been saved for a purpose. In the ensuing weeks we all took a long trip to see his family. The family did indeed love him, but was unsure if they were able to care for such a small baby. While we all hoped a happy situation would work out with his family, there was also a silent dread of the day when they might really take him away. He was finally, hesitantly, dubbed "Baby Zeke.” We all delighted in talking to and joking with "our boy" as he slept the hours away in typical baby fashion. He was beautiful, perfect, and bright eyed. Just a day or two ago Baby Zeke got malaria. He was feverish and fretful. We hated that he was sick. I told him often that I would gladly take the malaria for him if I could. Then just yesterday evening they noticed him taking a turn for the worse. I went home promising to pray for him. And pray, I did. Two hours ago, I walked into Danae and Olen's house for lunch. They were both home—both dressed in nice clothes. I stopped short. This wasn't normal. Other than soft worship music playing, everything was quiet. I was confused and ask if I should leave. Quietly they told me to come on in—that they were getting ready to "take him back to his family." Suddenly it hit me like a brick wall. "Did he die?" I blurted. They silently nodded. I dropped my backpack and collapsed into the nearest chair, too numb and shocked to think. Suddenly my eyes were full of tears and a terrible grief engulfed me. I knew I cared, but it staggered me, just how much. For a long time we sat in silence, each in our own private pain. Wave after wave of sorrow washed over me. After some time, Olen walked over and gave me baby Zeke. I could no longer keep my tears silent. I openly sobbed. Blood was still bubbling slightly from his mouth and nose, but for the most part he looked beautiful as ever. Oh, how I had loved this little child! My heart had melted as I watched him turn from blue to pink. Now my heart shattered as I watched him turn from pink to blue. At that moment I hated sin. I hated death. I felt so powerless. Here I had come to Africa to save lives, but I had been powerless to spare the life of someone so special to me. That was two hours ago. Now it’s time for me to report for my 18-hour night shift in Pediatrics. Oh how I pray no child dies tonight. I don't want to deal with any more raw heartache tonight. How the Father's heart must bleed. Reflections: This is why, some would say, it's never good to get attached. If my only goal was to shield myself from grief and heartache, then this may be true. However, God recklessly got attached to a whole world of dying children. By choosing to care, God gave Himself a trillion broken hearts. Nevertheless, "God so loved . . ." Wherever I look I see beautiful people I can't help but love. To see people I care about suffer is very difficult, but it is part of picking up my cross and following hard after Jesus. He loved as no other. Love hurts, but it is a good thing. Wow. That is so overwhelmingly sad. With such heartache in this world, I long for Jesus to come back. Thank you for sharing this, Heather. My prayers are with you and the people you are serving. Oh Heather, I'm so sorry. I can't stop crying as I think of your pain. But your arms will hold little Zeke again. Maybe in heaven you will get to be his mother and raise him, who knows. It's coming soon. And you're right, loving is worth it. Pain isn't our enemy. Sin is. Never confuse the two. Pain is one of God's most effective tools to wean us from loving this world and sin. Love you lots. My prayers are with you and I miss you so much!